Seoul is filled with great family-friendly activities. For the ICM participants accompanying family members, an on-site childcare facility will be available. 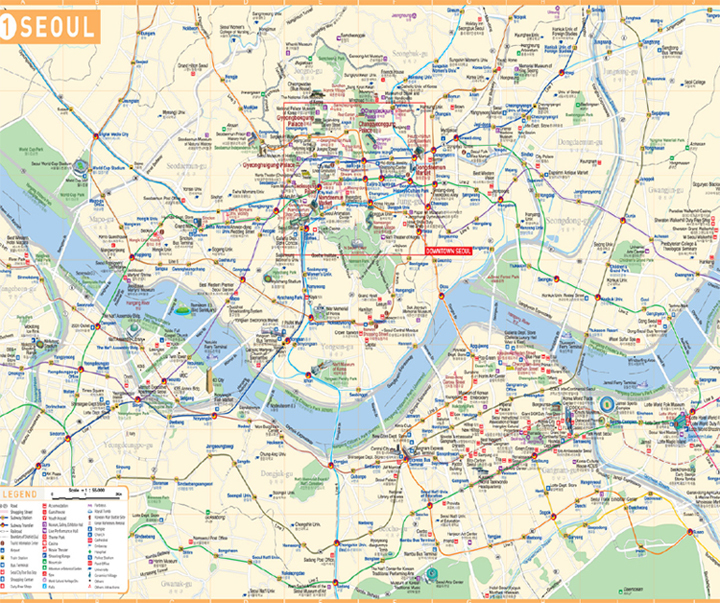 And we recommend some of Seoul’s best destinations for traveling family - from a day at a theme park to youth-focused outdoor events and countless playgrounds in the heart of downtown. 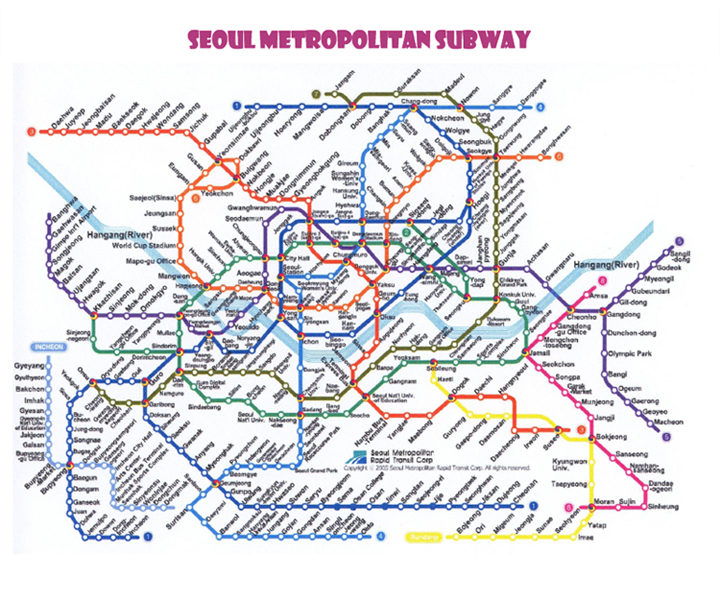 Three Disney-style theme parks (LOTTE WORLD, SEOUL LAND, and EVERLAND) are around 10 min to 1 hour bus/subway ride from central Seoul. Especially during summer season, all the theme parks are open until late at night performing fantastic laser shows and fireworks. Bring your family to Seoul ICM, and experience wonderful festivals and magnificent shows at the theme parks in Korea! Family-friendly ICM will make your journey all the more special. "Family-friendly ICM” hereby introduces a course that connects some of Seoul’s best destinations for the traveling family - from a kid-friendly cartoon exhibit to the exciting outdoor events in the heart of downtown. Best of all, the places highlighted on this tour are parent-friendly, too! N Seoul Tower was built in 1969 as Korea's first integrated transmission tower beaming television and radio broadcasts across the capital. Since opening to the public in 1980, it has become a much-loved Seoul landmark. The tower's main attractions include multi-colored digital art projected onto the tower at night, a digital observatory, a roof terrace, the HanCook restaurant, the N.Grill restaurant, and the Haneul (Sky) Restroom. - Exit 2 of Chungmuro Station line 3 & 4, Exit 6 of Dungguk Univ. There's a terminally fun and cute new way to learn about historical and present day Seoul -- from teddy bears! A cable-car ride up Nam San lands you at the iconic N Seoul Tower which now includes the Seoul Teddy Bear Museum, where various important figures in the founding and development of Seoul are recreated as teddy bears narrating the story of Seoul. Large models of many popular cartoon characters can be found throughout the Seoul Animation Center. Outside the center, visitors will find a 3.5 meter-tall model of Robot Taekwon V, and characters from "Dooly the Baby Dinosaur", "Fly Super Board" and "Jang Geum's Dream". Inside visitors will find characters from the popular animated series "Pororo the Little Penguin" and "Pucca". Families are encouraged to pose with their favorite characters, and take picture. Namsangol Hanok Village is a collection of five hanoks (traditional Korean houses) from the Joseon Dynasty (1392-1910), recovered from different parts of the city and relocated to the northern foot of Namsan (Mt.). The interiors of each of these five houses reflect owners from different walks of life, from the middle class to the yangban (who were mainly high government officials, noblemen and aristocrats). Seoul's most-popular show is Nanta. Each year, an estimated 380,000 foreign visitors enjoy the award-winning performance! One reason why Nanta is popular is because it doesn't rely on language. Instead, it uses the universality of music and motion to excite audiences. The music combines traditional Korean folk rhythms with modern beats and the fun storyline. There?셲 so much to see, hear and even do that Nanta should be a lot of fun for the whole family! Shows run nightly at 17:00 and 20:00; Additional 14:00 show on Saturdays. Jump Amazing acrobatic feats take place in a funny story about a quirky Korean family whose home is infiltrated by two silly thieves. Miso Follow two young lovers as the seasons change. An entertaining mix of traditional Korean music and dance, but not ideal for young children. Opened in 1989, Lotte World is a major recreation complex located in downtown Seoul. It consists of Indoor Adventure, the world's largest indoor theme park, an outdoor theme park called Magic Island, a luxury hotel, the Korean Folk Museum, shopping malls, department stores, sports facilities and a movie theater, all in one place. Furthermore, should you miss the World Carnival Parade that's conducted each and every night from 19:30 to 20:00, hopefully you won't miss the 21:30 Cosmos Circus Laser Show. As you can tell, there are many things to see and do at Lotte World. Monday - Thursday: 9:30 a.m. - 11 p.m.
Friday - Sunday & National Holidays: 9:30 a.m. - 11 p.m. Hours for some attractions (e.g. Magic Island) may vary. Please check the Lotte World website prior to visiting. is the largest underground shopping mall in Asia and is connected to several exhibition halls, a convention center, a hotel, a department store and an office building. The mall houses around 260 stores and leisure facilities including fashion, beauty, entertainment and cultural spaces, and offers a pleasurable one-stop shopping experience, regardless of the weather. As the largest marine theme park in Korea, COEX Aquarium showcases the incredible diversity of aquatic life around the globe across a series of 14 themed discovery zones, from the heights of the Andean mountains to the depths of the Amazonian rainforest, in ecosystems ranging from rivers and swamps to the deep sea. EVERLAND is Opened in 1976, and it is ranked as the 4th theme park in the world by offering 5 main Festivals and exciting entertainments all year around. Experience wonderful Festivals and magnificent shows at EVERLAND, 365 days a year. There are five theme areas along with more than 30 kinds of attractions full of high thrilling and various fun. A megaton-grade tornado is waiting for you! Give in to the force of this megaton-grade tornado ride, which revolves 19 meters up from the ground, and experience the thrill of a powerful hurricane. More than 30 European dishes satisfy the tastes of three generations, and help you make great memories! A fairytale tour aboard a memorable carousel to the ball of the royal family in Medieval Europe! Ride a white horse and pretend to be a character in a fairy tale! Don't miss the great opportunity to meet the carnivores like tigers and lions are gathered all in one place! Enjoy a bigger, wider Safari-World that contains a wide variety of fun! Outstanding outdoor water park in EVERLAND! Caribbean Bay is the biggest indoor and outdoor water park in the world, which reproduced Caribbean Bay in Latin America. You could enjoy Caribbean romance all year around. Exciting waves and surfing at the wave pool, the world's longest lazy river, sandy pool, kiddy pool, various water slides for great adventure and thrill, salt sauna of healthy skin all await you. The Korean Folk Village is open all year-round and nearly 1.8 million domestic and foreign tourists visit here throughout the year. The Folk Village is a venue where visitors can learn Korean culture in a short time through the collection, preservation, research, exhibition, education and exchange of Korean cultural materials. It also provides an outdoor folk museum, already renowned as a world-class tourist attraction, so that visitors can experience the lifestyle of the Korean people. Already valued as a symbol of the Korean culture, the Korean Folk Village shall continuously endeavor to grow and be admired and acclaimed by people from around the world. Lotte World Ice Rink, located inside the Lotte World complex, is Seoul's premier all-season skating destination. The 1,000 capacity rink is easily accessible via Jamsil Subway Station, and thanks to its spectacular domed glass roof, skaters can enjoy the feeling of being outdoors while enjoying total protection from the elements. The Ice Gallery is an indoor ice sculpture art gallery and experience center located in the center of Seoul. The Ice Gallery has various ice sculptures on display, and in order to keep the ice sculptures from melting, the temperature inside the gallery is kept at below five degrees Celsius! Visiting the Ice Gallery a very chilling experience, which makes it a great place to visit for escaping the heat of humid, sultry Korean summers. The Ice Gallery also offers an ice sculpture experience where visitors can try making ice sculptures of their own. 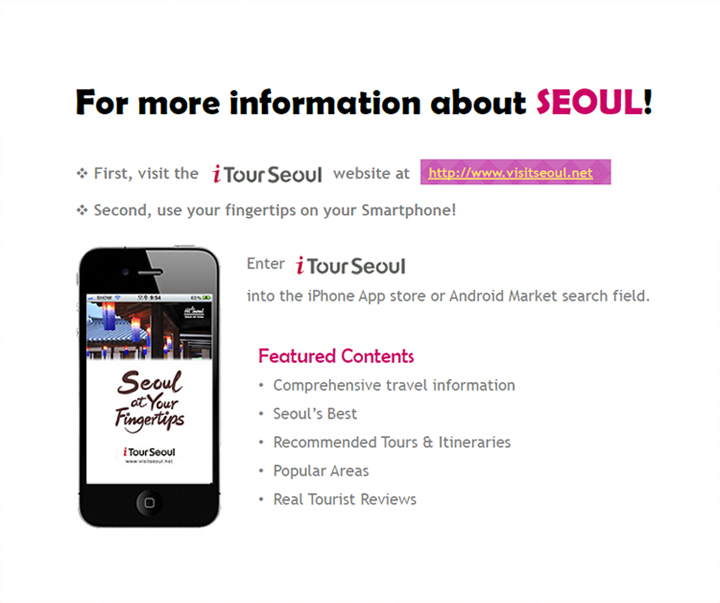 When you look at recent tourism trends, it seems like more and more visitors to Seoul want to do more than just see interesting places and events - they want to participate in them, too! Lucky for you, Seoul has many of these "hands-on" activities where foreign guests can enjoy a memorable experience while learning about traditional Korean culture and events! Let's Get Started! Without a doubt, Korea's number one signature food must be kimchi! Kimchi is made from fermented vegetables with varied seasonings. Inside Myeong-dong's Experience Kimchi, you can experience Korean culture and history through this vital Korean food. The Experience Kimchi's kimchi making program takes about 30 minutes. When you're done (and if there’s still time) feel free to try on a traditional Korean hanbok outfit. Historically, Korean paper was celebrated throughout Asia as some of the best available anywhere. The paper created from the Korean mulberry tree is known as hanji, and it was said that it could last 1,000 years! You can see why when you experience the strength and the beauty of hanji! One of the best places to learn about Korean traditional paper and to make various objects with it is Hanji & People, a workshop located in the popular Insa-dong neighborhood. With craft classes conducted in Chinese, English and Japanese, participants can choose from more than one dozen different easy-to-make projects that take anywhere between one to three hours to complete. For example, you can make a beautiful hand mirror or a picture frame. The more ambitious art student can even endeavor to create a traditional doll! Changdeokgung was home to the Joseon government and was also the favored residence of many Joseon Dynasty kings. This makes Changdeokgung the longest-serving royal residential palace. Compared to other palaces, Changdeokgung is well-preserved and still has many of its original features. In 1997, Changdeokgung was added to the UNESCO World Heritage List. **Combined tickets are valid for one month from purchase. Gyeongbokgung was the first royal palace built by the Joseon Dynasty in 1395. The palace was located at the heart of newly appointed capital of Seoul and represented the sovereignty of the Joseon Dynasty. The largest of the Five Grand Palaces (the others being Gyeonghuigung, Deoksugung, Changgyeonggung, Changdeokgung), Gyeongbokgung served as the main palace of the Joseon Dynasty. Of Seoul's five royal palaces from the Joseon Dynasty (1392-1910), Gyeongbokgung (Palace) is the largest. To help recreate what life was like during Korea's royal era, visitors can experience a change of the royal guards at the entrance of Gwanghwamun (Gate) throughout the year. Once the bell is rung, the ceremony begins! The bright colors, beautiful outfits, and the bold banners and flags combine to make the elaborate ceremony a favorite event among visitors to Seoul. When the reenactments started in 1996, the original records were reviewed to ensure that today's ceremony honors the traditional one. In fact, there are actually two different ceremonies - one marks the opening and closing ceremony of the royal gate, while the other signifies the changing of the guards. Note: The ceremony does not take place on Tuesdays, when Gyeongbokgung (Palace) is closed. Generally, the Opening/Closing ceremony occurs between 10:00~15:00 from March to June and September to November. The Changing of the Guard ceremony occurs January to February, July, August and December between 10:00~16:00. The Seoul Land was opened in May 1988 right before the 1988 Seoul Olympic Games as one of the representative Theme Parks in Korea. Under the 5 different themes, Seoul land created 5 theme places in the name of World Plaza, samchulli land, Tomorrow land, Fantasy land, and Adventure land. Each place has its own characteristics for the theme and provides a lot of different amusement facilities, performances, exhibitions and events including flower festivals of tulips, cherry blossoms and mums in different season. Especially during summer season, Seoul land is open until late at night performing a fantastic Laser show and Fireworks. March - October 9:30 a.m. - 10 p.m.
Attractions include zoological and botanical gardens along the reservoir at the northern valley of Mt. 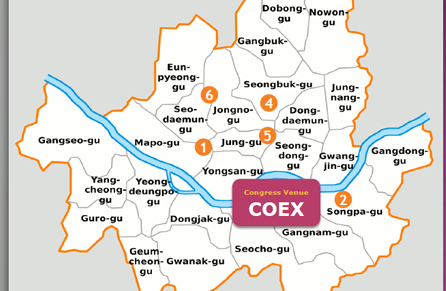 Cheonggyesan; the IT World, National Museum of Contemporary Art, and Youth Campground in the center; and the amusement park Seoul Land at the southern part. Subway Line 4 and multiple bus lines directly connect to the entranceway. The park is easy to get to from the metropolitan area, making it the best place to be for families and lovers. The National Museum of Contemporary Art is an exquisitely designed museum, combining both classical and modern architectural designs in harmony with its natural surroundings. The museum displays the changing trends in traditional and modern Korean art and culture while juxtaposing these changes with art from the rest of the world through diverse exhibitions on a variety of Korean themes. There is a variety of permanent and special exhibitions as well as a range of cultural events, including concerts, film screenings and performances. Closed Mondays and January 1st. The Children's Gallery of the National Museum of Contemporary Art, Korea opened in 1997 to promote children's creative education. After 14 years of opening, we now have moved to a larger space where children can use their imagination in a more comfortable and pleasant environment. In the new Children's Gallery, we will continue to base the exhibitions and educational programming on major acquisitions and permanent and special exhibitions the museum. Our hope is for children to have fun and enjoy being creative.